The first thing you’ll want to do is set up your master slides. I prefer to always set up my backgrounds using master slides. This way, if I decide I want to use the same layout on a different slide, I can apply it easily. It also helps reduce time spent making small adjustments on each slide, since I only have to do it once to have it automatically applied on all slides with that layout. If you don’t want the title to actually appear on your slide, just place it off to the side so it’s outside the visible part of the slide. 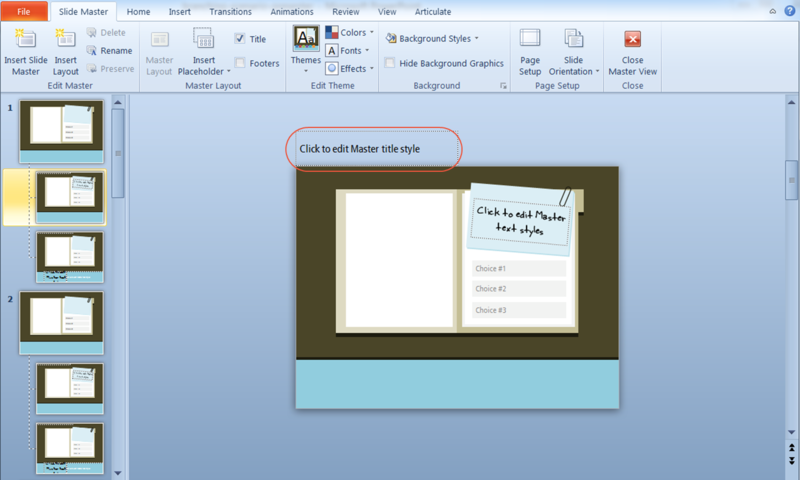 Why should you add title placeholders to your master slides? One reason is that any text in your placeholders will automatically appear in the outline tab of your presentation, which makes it easy to see a quick overview. Adding title placeholders makes the titles appear automatically in the slide properties. Then, defining your branching options is a snap since you can easily see which slide is which. PRO TIP: Name your layouts so you can easily select the one you want to apply. 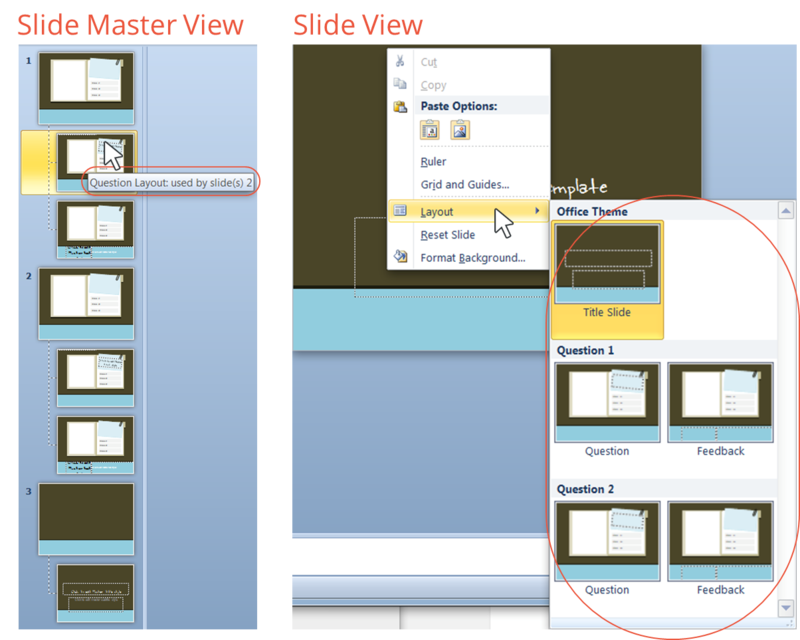 To do so, just right-click on the layout in the slide master view and select Rename Layout. The layout name should appear when you hover over the layout in the slide master view, as well as in slide view when you right-click on a slide and select Layout. Now that your master slides are in place, you can add question content (this starts the branching) as you normally would. Don’t forget to name your slide! The next step is to add a feedback slide for each option. Don’t start adding content, just add blank slides and name them according to the choice number. Go back to your question slide and select your choices, in this case the three rectangles. 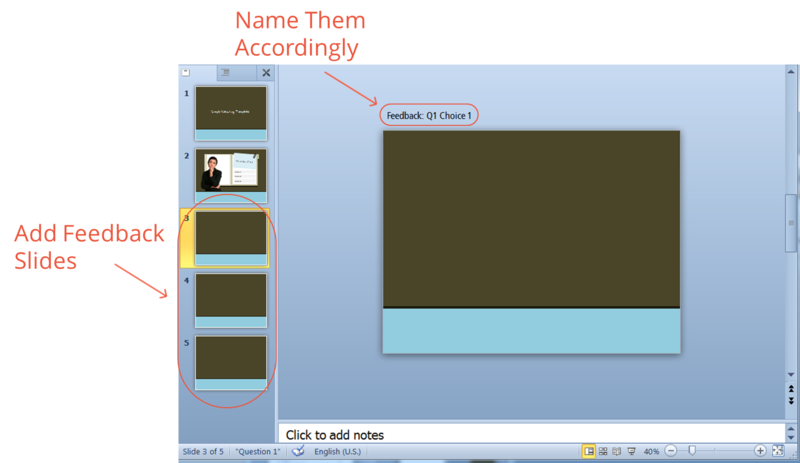 Cut and paste them from the question slide to the master slide. Putting your buttons on the master slide instead of directly on your question and feedback slides saves you the trouble of duplicating them exactly onto every slide where they need to appear. If you make adjustments later, rather than having to make all the same edits on every slide, you can make the changes once, on the master, and they will be replicated in all areas. Doing this limits the potential for small, distracting discrepancies between similar slides—plus it’s a time-saver. Turn the rectangles into buttons, and then add hyperlinks to the rectangles to link them to the corresponding feedback slides. The next step is to personalize your feedback slides. Start by selecting the layout, and then add in your content as usual. 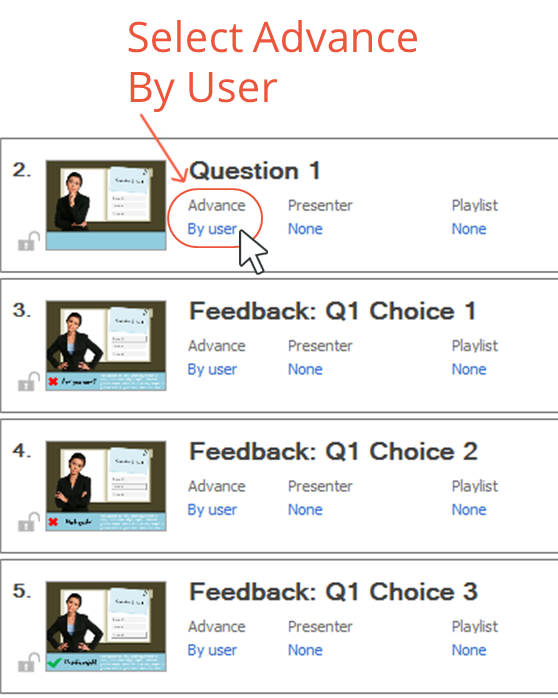 In this example, I added a different pose and feedback message for each slide as well as a transparent rectangle with a border to highlight the selected button. 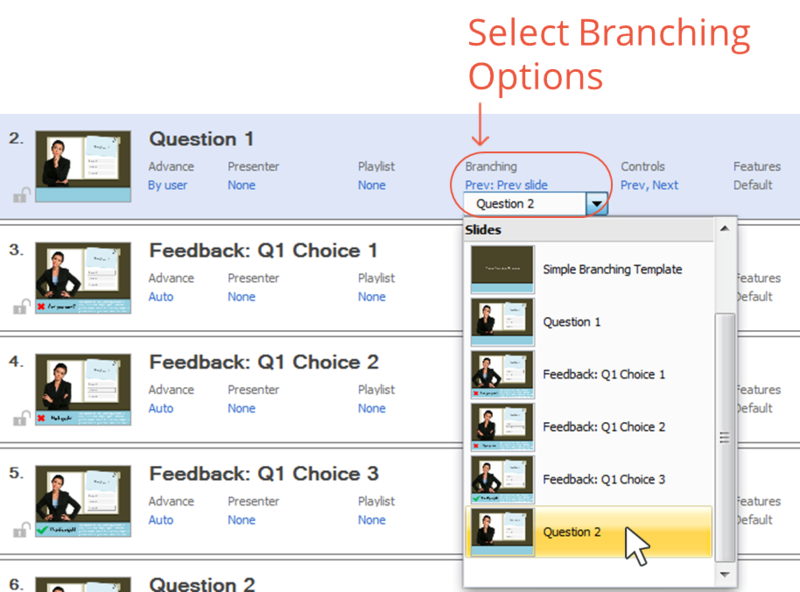 When you’re creating a branching scenario, don’t forget to adjust your slide properties so the slides don’t advance automatically before the learner has a chance to choose an option. You should also adjust the branching options so the player buttons (Previous/Next) lead your learners to the correct slides. So how do you decide where your branching slides lead? It all depends on who you ask. I think that if you’re using your branching scenario as a learning opportunity, the question slide should serve as a menu of sorts and all incorrect answers should bring the learner back to it. Other people will tell you that the slides should continue in a linear order, so the learner doesn’t feel stuck in an endless loop. I would suggest trying out both, and having other people test the two options to see which they prefer. 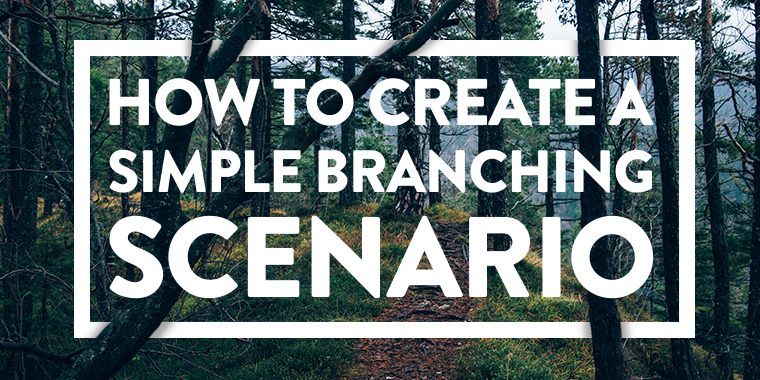 Now your simple branching scenario is all ready to go! Simply repeat the same process for each additional question to create more branching scenarios. To check out the published course, click here; or, to download the free template, click here! Want to try something you learned here, but don’t have Articulate software? Download a free trial, and come back to E-Learning Heroes regularly for more helpful advice on everything related to e-learning. If you have any comments, please share them below. I was looking for something similar! Will definitely use it as a reference model. Thanks, Allison! Very informative and easy to understand storyline tutorial. Thanks for your contribution. This was very helpful, Allison. I was looking for a step-by-step process instead of a theoretical how-to article and this really fit the bill. Can't wait to try it. Thank you! You're welcome! Glad you found it to be helpful. Feel free to share your own branching scenarios, I'd love to see them! Good stuff, thanks Allison! I get this question sometimes in the Daily Demo and it will be handy to have this as a reference.